"With his second concerto disc, Yevgeny Sudbin celebrates the close relationship between two great Russian composers: Sergei Rachmaninov and Nikolai Medtner. 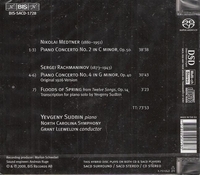 Medtner would encourage his more famous colleague during the latter’s bouts of self-doubt, while Rachmaninov early on recognized Medtner’s unique gifts, pronouncing him the ‘greatest composer of our time’. The most sincere testament to their friendship is embodied in these two concertos, which the composers dedicated to one another."